You’ve worked hard to create a team of qualified wellness professionals who deliver a range of services to your clients. But does your clinic blog reflect the unique wisdom and experience they each bring to the table? It lightens your load as the clinic owner to produce all the content. It gives each practitioner the chance to develop and express his or her own individual identity (brand) as a wellness professional. It demonstrates the depth and variety of the services and approaches available at your clinic. It helps your practitioners, clients, supporters and friends promote your clinic by sharing links to practitioners’ posts on social media. It cultivates a sense of teamwork, belonging and pride amongst the blog contributors. Starting a blog and posting consistently can be challenging, and having more bloggers can mean there are more ways for things to go astray. 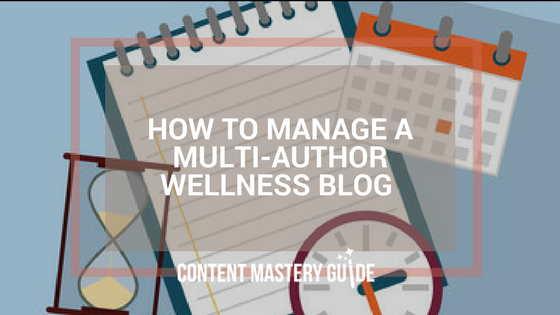 Let’s go through some concrete tips for how to manage a multi-author wellness blog for ultimate success. Long before publishing your first post, create a clinic or team blogging plan so that everyone is on the same page (here are the five things to include in your clinic blogging plan). Create a shared calendar for editorial topics and timelines. Make it easy for writers to plan ahead, and for you or your editor to follow up as needed. Try Google Calendar or blogging-specific WordPress plugins such as CoSchedule, Edit Flow, or Editorial Calendar. Hold regular meetings for the blogging team, where you can brainstorm ideas, troubleshoot problems, and celebrate results. If you keep restating the blog’s purpose and goals, it will boost motivation and enthusiasm for the project. Offer alternatives for reluctant writers. Some of your practitioners may not have the time, patience or skill for writing, but with a little creativity, everyone’s voice can be heard. For example, let them talk out their ideas as a video or audio recording. Then have an editor or ghostwriter turn those ideas into a written post or a bulleted list of highlights published along with the video or audio message. Readers will not remember to visit your blog, so you have to invite them back to read every new post. Ask everyone on your team to share links to the latest blog post – on social media, in their email signature, or in response to a question related the post’s topic. You can even supply pre-written social media teasers that will get readers curious about the post. Give readers an easy way to share your posts on social media by installing social sharing apps and plugins (ask your web developer for help and recommendations). As well, show your appreciation to your blogging team by spotlighting your contributors in your clinic communications on social media, in emails and/or newsletters, and in flyers posted at the clinic. Maintaining quality – When writers are feeling pressured to finish a post on time, or just unsure of how to write an effective blog post, quality can vary. Share examples of the types of posts you’re looking for, as well as a style guide or simple checklist for writers. Running out of steam – Things start out well, but then begin to fade. Eventually, posts get less and less frequent and in some cases they stop completely. Sometimes it’s because contributors aren’t seeing clear results so they have no motivation to put in the effort. Hold regular meetings to discuss concerns and celebrate results. Work as a group to brainstorm topics and reignite enthusiasm for the project. Losing contributors – If one of your prominent bloggers or even the blog manager leaves the clinic, gets an influx of clients, or has a personal situation, the blog can flounder. Head back to the drawing board and make sure all five elements of your blogging plan are in place and still relevant, including someone to take ownership of the blog. Competing priorities – There are many moving pieces in the day-to-day life of your clinic, and sometimes blogging might need to take a back seat. Do what you have to do, whether that’s stretching out the frequency of posts or taking a break. Get back on track as soon as you can. Always start with a fresh blogging plan so everyone has clear guidelines and the same goals in mind. A clinic blog can give your practitioners more visibility and credibility to potential clients, current clients, referral partners and other supporters. Use these strategies to ensure your blogging team’s success. P.S. How healthy is your wellness clinic blog? Join me for a personalized review and free advice.